From Fiscal Year 2008 to Fiscal Year 2017, the United States gave Lawful Permanent Resident status to 1,761,927 on humanitarian grounds, which is larger than the population of Philadelphia, Pennsylvania, according to a press release from the White House. The White House mentioned on Thursday the variety of programs and laws that provide for the refugees to gain such status in the United States. Individuals admitted under these humanitarian immigration programs include: refugees admitted through the refugee resettlement program; parolees; cancellation of removals; special immigrant interpreters, beneficiaries of the Nicaraguan Adjustment and Central American Relief Act (NACARA); beneficiaries of the Haitian Refugee Immigration Fairness Act (HRIFA); Special Immigrant Juveniles (SIJ); Victims of Human Trafficking and Other Crimes (T Visa); Victims of Criminal Activity (U Visa); Battered spouses or children AND parents battered or abused, of U.S. Citizens; Cuban Haitian Entrants; and Parolees Adjusting Under the Help HAITI Act of 2010. Additionally, during the last twenty years, 442,071 individuals were granted either Temporary Protected Status or Deferred Enforced Departure. Humanitarian-related immigration accounted for one-sixth of all immigration into the United States in the past decade. The grand total of immigrants America has resettled since 2008: 10,743,014. These numerous programs, especially for the numerous low-skilled immigrants who come to America, place a financial strain on the Government. Our expansive humanitarian-based, family-based, and lottery-based immigration system fails to consider the needs of American workers and taxpayers, who have been burdened by decades of low-skilled immigration that has suppressed wages, fueled unemployment, and strained federal resources. Census data shows that current U.S. immigration policy admits large numbers of individuals who struggle to become financially independent and instead rely on a vast array of government benefits paid for by U.S. taxpayers. For instance, roughly half of all immigrant-headed households use one or more welfare program. 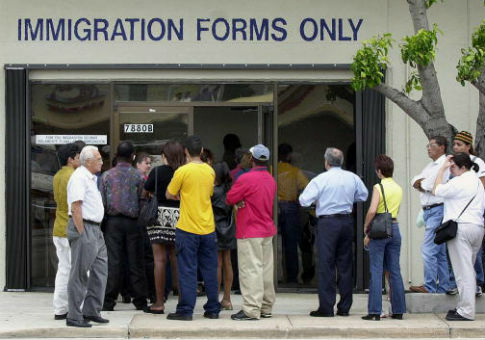 Under our current refugee and asylum programs, the federal government brings in hundreds of thousands of mostly lesser-skilled migrants into the United States, on top of other legal immigration flows, who can quickly become eligible for cash and non-cash federal welfare, federal entitlements, free medical care, education and a host of state and local benefits. This entry was posted in Issues and tagged Immigration, Philadelphia. Bookmark the permalink.